I will be honest with you. Even though I like to think of myself as a man of culture, and often claim to be to my surroundings, it is not all aspects of cultural life, which I encounter with the same degree of enthusiasm. Indeed, some cultural areas, I even seek to avoid. One of these areas, I am ashamed to admit, is the land of museums! I know they are filled with important and interesting objects, which I should like to indulge in, but nevertheless, I find museums so very boring. Recently, however, I had to pass the steps to a museum. As a part of a field trip in my course of Italian Donaldism here at the Academy, I had the pleasure of visiting my old home town with a group of young female students, and although I tried to persuade them to leave my at the café di cappuccino outside, they insisted that I should follow them into the Museo dell’Artifacti Donaldismo (M.A.D.). I am very glad that they did. First of all, I learned that they actually serve a very fine cappuccino at the museum café, much cheaper than outside by the piazza, and furthermore, I saw some Donaldistic objects, which I had never seen before. The object in question is, as you may know, a Barksian lithograph done by il Maestro in his later period. I was quite stunned to see this, as my attention naturally and immediately was directed towards the arch of the doorway behind the carpet-flying caliph. How interesting to find a Romanesque-like round-arched doorway in an Arabian palace - and how even more interesting to look at its decorations: the doorway is wreathed by a mainly blue frieze containing a band of yellow cloverleaf-like symbols on a red background with a yellow outline. »Hmm. Very nice,« my students politely replied and began to move on. »But haven’t we seen this sign before?«, I then asked them. As I now ask you. And the answer is of course: Yes, we have! In my inaugural lecture here at the Academy, back in 2006, I duckumented the existence of a Duck crusade in medieval Stella anatium, apparently directed from Southern or Western Europe to the Middle East. 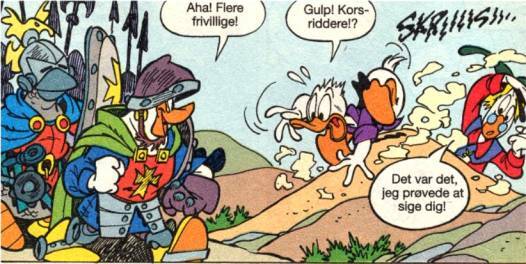 Before even going there, our hero Donald Lionduck in his hometown of Duckthorpe meets Captain Crushstar, whose broad chest is decorated by a yellow cross on a red background - the sign of the Knights of the Cross. Arrived in the Middle East, Donald bumps into more Knights of the Cross, this time immediately recognizing them by the sign of the cross on their armour. 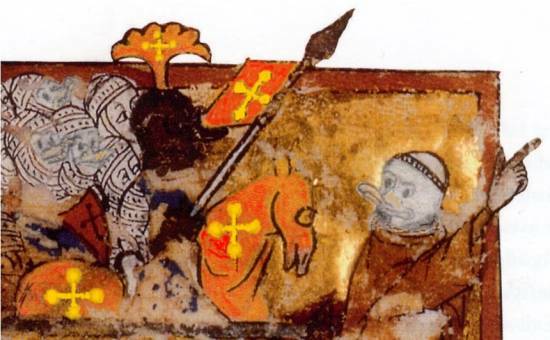 Obviously, the crusade of medieval Stella anatium was fought by a military order of crusading knights from various countries, but fighting under one common symbol: the sign of the yellow cross on a red background. 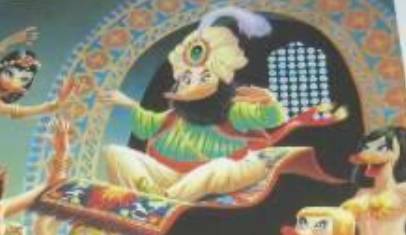 ..and we might even still find a reminiscence of the Duck crusaders in present-day Duckburg in the (not quite so secret) society of Knights Templars, whose lodge building (among other) is decorated by red shields with yellow crosses - very similar to the ones in the caliph’s bathroom. To find the knights’ sign of the cross in Duckburg is perhaps not so surprising, as the crusade is likely to be a part of the immigrating Ducks’ history. But how do we explain the presence of crusading symbols in the caliphate palace? Has the Caliph of Baghdad joined the crusade as well? Not likely! 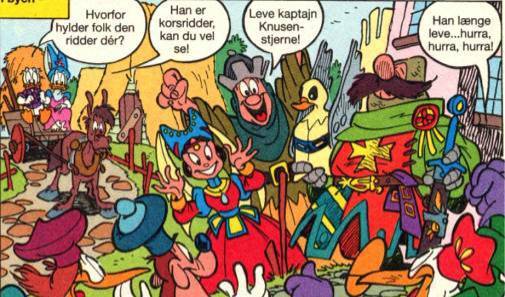 As you might remember, the crusade was not at all going well for the Knights of the Cross, when Donald Lionduck temporarily joined their forces and helped them retake one of their lost fortresses, but shortly after, we learn that the enemy again is moving forward and now even threatens to invade a Mediterranean island. It is my belief that the caliph represents this enemy of the crusaders, perhaps he is even its very leader - or at least one of his descendants, as we cannot actually date the picture. Most likely, the Caliph of Baghdad came out of his encounter with the Knights of the Cross victorious - he kicked their white-feathered arses, so to speak - and after the expulsion of the crusaders, it is my thesis that he put their abandoned, but beautifully decorated buildings to new use. The building in question to me appears to be an old church. Until now, I have been very careful not to put to much symbolism into the cross, but it is of course difficult to completely ignore the possibility of some religious ideology backing up the crusading knights, especially when they seem so attached to the Sign of the Cross. So, yes, I will now say it out loud: The Knights of the Cross in medieval Stella anatium might have been...religious! I will even dare to add: They might have been Christians!! Certainly, the round-arched doorway has a striking similarity with the portal of a typical Romanesque church, as you would expect to find them in medieval Europe of Terra homines (i.e. our world), especially at around 1100 to 1250. The portal connected the two main rooms of the Romanesque church, the choir and the nave, but from the angle of the picture, I cannot determine which of these rooms we - or rather, the caliph and the girls - are most likely to be in. However, the nice pool might indicate an enlargement of the former baptismal font, which in the Middle Ages was usually located in the nave. So, after driving out the Duck crusaders and taking over their abandoned remnants, the mighty Caliph of Baghdad has turned the their church into a bathroom for - what I expect to be - his many young daughters, who, based on their happy smiles and thumps-up to their flying father, appear to be very pleased with this hygienic arrangement. The Sign of the Cross can also be found on the window decorations of the building, shown in another Barksian lithograph of that same period. Here, we appear to be in the girls’ tea room, where their father admires samples of their clever handicraft (a string of painted snail shells, I think, but the quality of my polaroid picture is unfortunately not the best), and although the bad lightning makes it impossible to distinct the colour of the crosses in and above the window behind the caliph, the shape of the sign is unmistakable. Now, some might see the turning of a consecrated church into a bathroom as an act of blasphemy. Just like the Vikings of our world are known to have turned Christian churches of Europe into stables for their horses. After a long, brutal war with the Knights of the Cross, such an action would perhaps not be unlikely from any victorious lord, but in this case, I am inclined to a slightly different explanation. If you look carefully on the first picture, not only the princesses, but also their father has quite a happy smile on the beak, and probably he as well is very delighted with this new arrangement with a separate building for his daughters with one giant bath tub big enough for them all : any father of teenage daughters will know what a complete nightmare the bathroom-situation otherwise easily could turn into with a brood of no less than 10 daughters! Compared to that the war against the crusaders was probably much more silent and pleasant for the caliph. And by letting his daughters bathe under the Sign of the Cross, he and his family will always remember, how defeating one problem can lead to the solving of another.